For Monday I’m exploring some creative dining spaces for Scranton Pa. Apartments. Or any apartments of course! 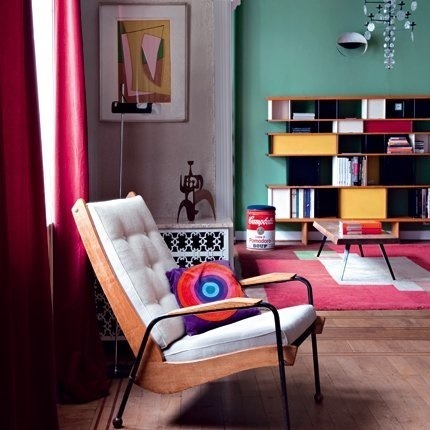 These ideas are infused with color. They add brightness and show a unique spirit when living in Scranton Pa. 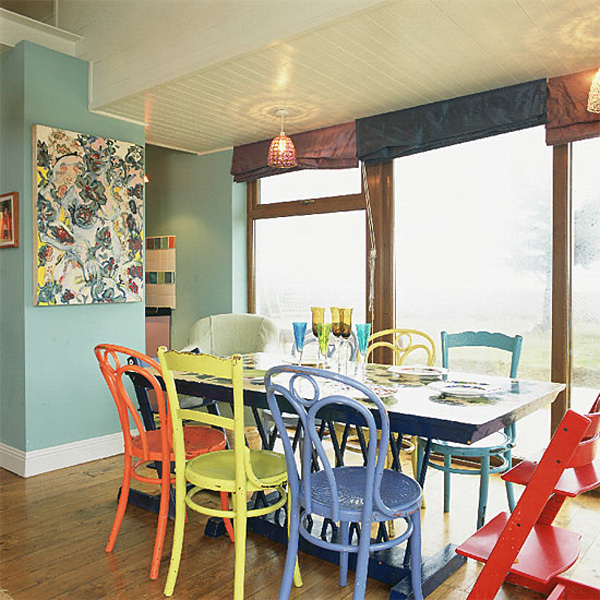 The chairs and table above, all different and of different colors, add a youthful feel, yet are very adult. Getting chairs at yard sales and flea markets and different paint colors make this an easy and spirited apartment dining space idea. Going deep and fabulous! In this unique pink for your Scranton Pa. apartments. 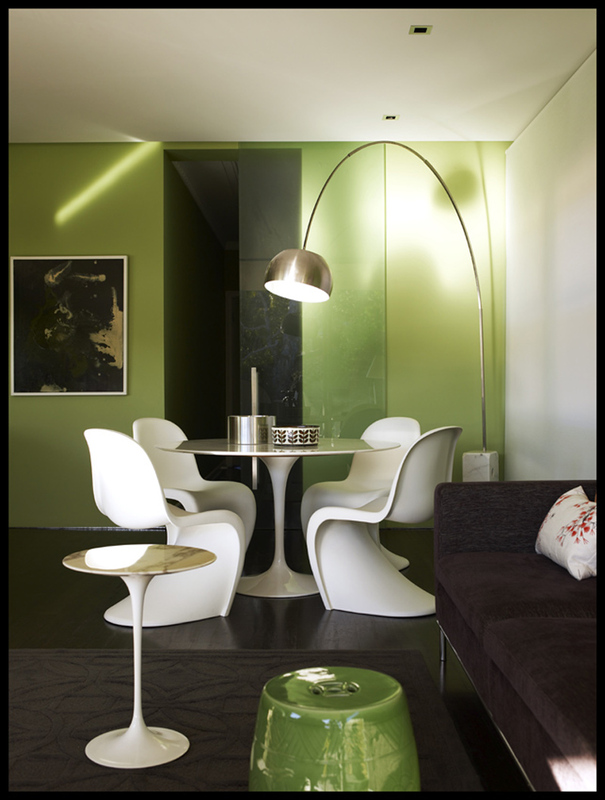 Mean and green and ultra modern…green, gray and white add a soothing touch to your Scranton Pa. apartments. 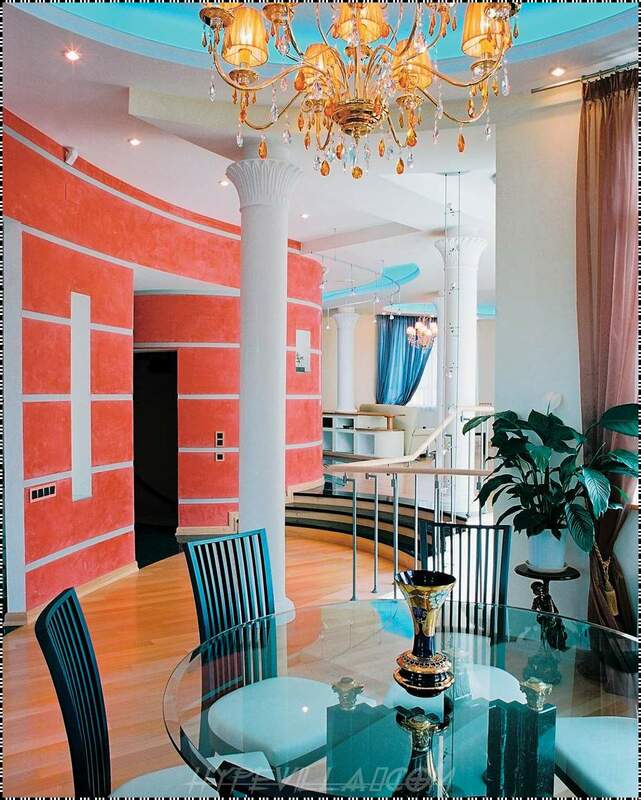 Blue and orange statements give a lovely feel to this grand living space. Love to see that glass top tables are making a come-back! 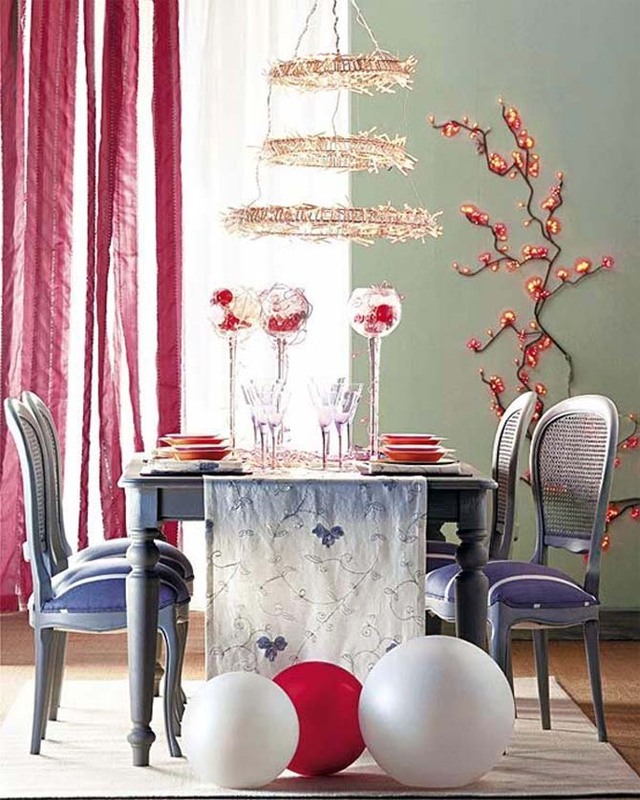 This is considered a Christmas table via Dining Room Design, but I love the color choices here for other occasions as well. Looking for available Scranton Pa. apartments for rent? Visit Apartmentstolike.com for listings. Landlords with available Scranton Pa. apartments can list for Free! If you are moving into one of the many available Wilkes Barre apartments you may be considering a fresh start. And what better to enhance your new apartment than looking into new decor options, and with black and white decor you can’t go wrong. A quick drive from any of the local Wilkes Barre apartments will take you to the local Pier 1 Imports, a great economical decorating store that features everything for your new Wilkes Barre apartment. You will find furniture, glassware, lamps, bedding and fresh design ideas. 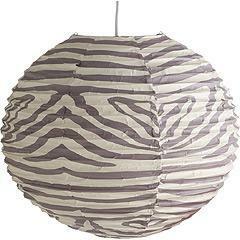 Like this black and white chair and this great Zebra Striped Paper Lantern. This lantern lamp could be featured in any room of your Wilkes Barre apartment. Over a desk area would be a cool option, or in the corner of the living room. If you are fortunate enough to find one of the many available Wilkes Barre apartments that offers a nice dining room in the space, then dining room chairs and a nice table are something to think about. 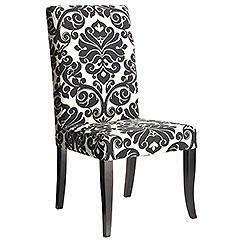 Go creative with black and white, like this Damask Dining Chair from Pier 1 Imports. 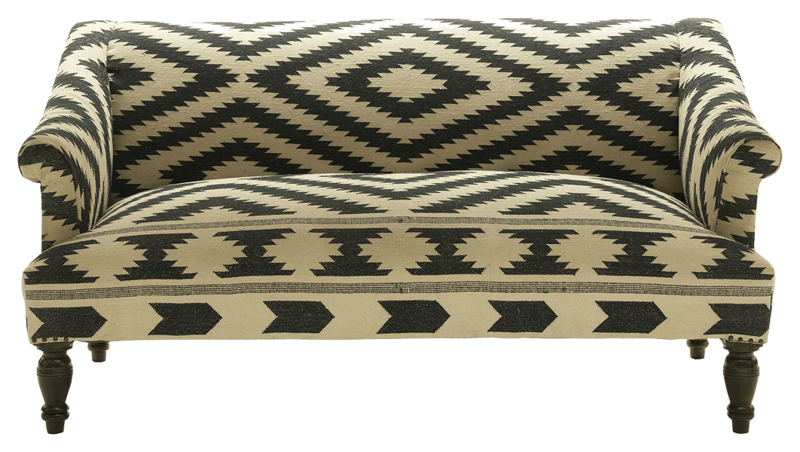 Why not go totally unique in your Wilkes Barre apartment with this Kilim sofa by Andrew Martin. I love the design and the structure of this sofa. Creative and unusual for your new apartment living room. 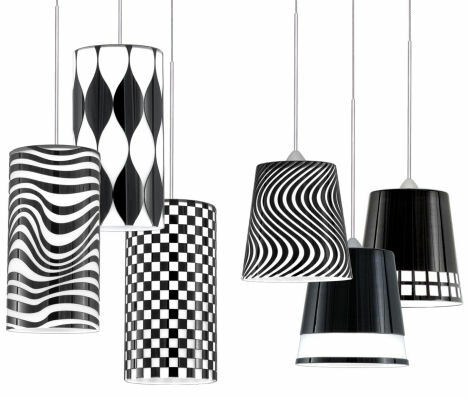 Gotta love these black and white design pendant lamps. They would be great over your Wilkes Barre apartment kitchen island, or over the dining table. Nice accents for office area too. From WAC Lighting. And let us not forget your new Wilkes Barre apartment bedroom. Dino Direct features this Maple Leaf Print Cotton Bed in a Bag for only $64.62! Cool! Looking for available Wilkes Barre apartments? Visit ApartmentsToLike.com for listings of available space. There’s something about a peach apartment. Nothing says more of elegance, warmth and romance than a lovely warm peach shade of color to highlight your Wilkes-Barre apartment’s decor. 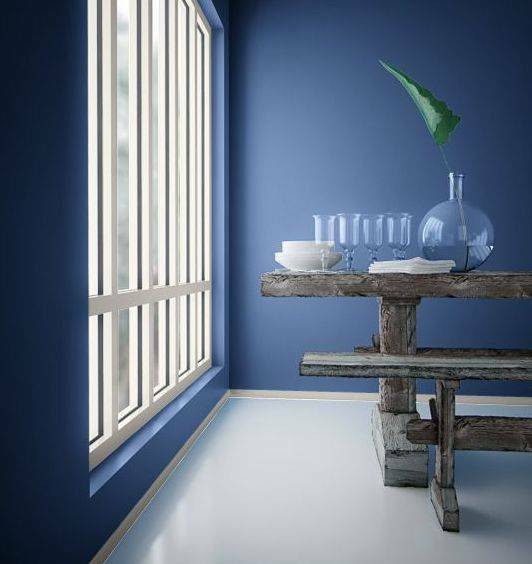 Consider this color when looking for a change in overall feeling to your new place, or your old one. 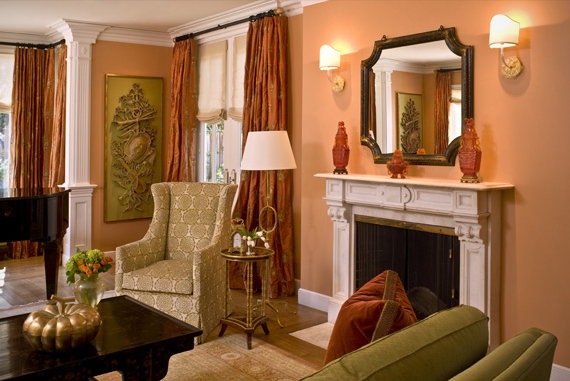 Here, I love the contrasting colors of rust and olive green to balance the peach toned walls. White accents and dark wood always work. Image via Food and Home. 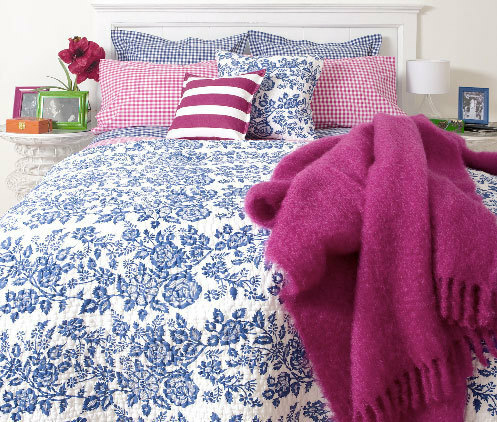 What can be lovelier to softly brighten a young girl’s room in your Wilkes-Barre apartment? Image via The Kid’s Room Decor. Need a new idea for your Wilkes-Barre apartment? 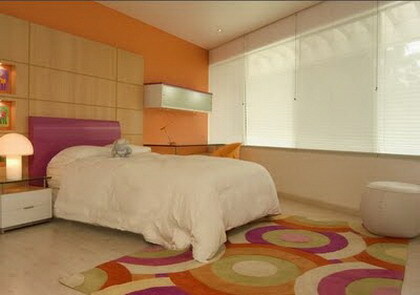 This peach and plum decor contemporary bedroom idea is refreshing and fun. 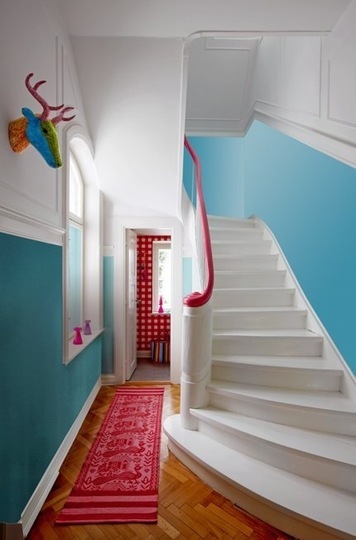 Image via Interior Ideaz. 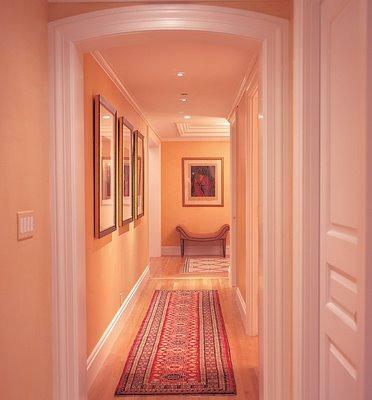 Soft peach adds brightness and warmth to a long hallway in your Wilkes-Barre apartment. If your apartment is in an older house or mansion that’s been converted to apartments you will often find gorgeous door frames and window frames that can be contrasted with white as shown here. 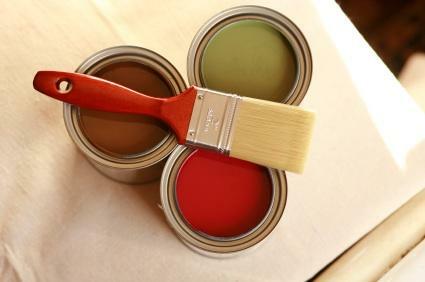 Check with your landlord for the okay to your creative painting ideas. Image via Home Design. 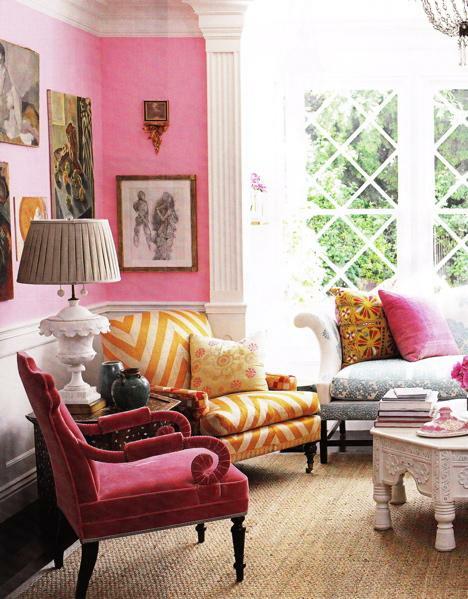 This goes on my list of favorite rooms: a peach Moroccan-style living room with pink and beige toned highlights. 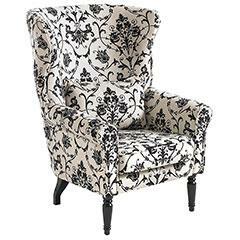 Dynamic yet warm…perfect for a unique change in your Wilkes-Barre apartment. image via A Touch of Luxe. If you are looking for a Wilkes-Barre apartment, or one in Luzerne county of PA, visit Apartmentstolike.com for available listings. When you are living in your Wilkes-Barre apartment, you are living in a city immersed in Pennsylvania history. This article will give an overview of this lovely city of Luzerne County in Northeastern Pa. for those considering moving here or renting an apartment near-by. The city of Wilkes-Barre was originally settled in 1769. It is named after its two founders, John Wilkes and Isaac Barre (1806) and from what I gather is the only hyphenated city in the USA. (Just a bit of trivia there!) The city was mainly an industrial anthracite coal town in the late 1800s and early 1900s where it saw a boom in economic wealth during this time. By the 1950s the coal industry had dried up, but the city continued on, though it suffered some bump and bruises along the way. (Agnes flood of 1972 I’m thinking of). The city has recently been renovated and is quite beautiful. 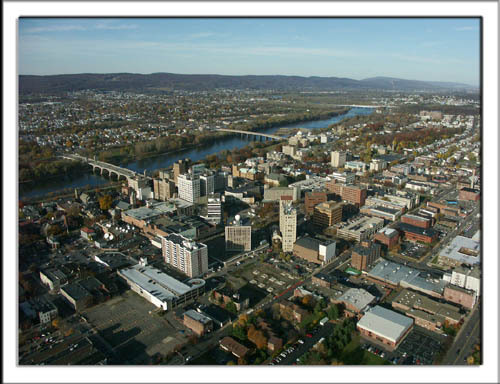 From your Wilkes-Barre apartment you will experience a diverse and dynamic amount of things to do and see. 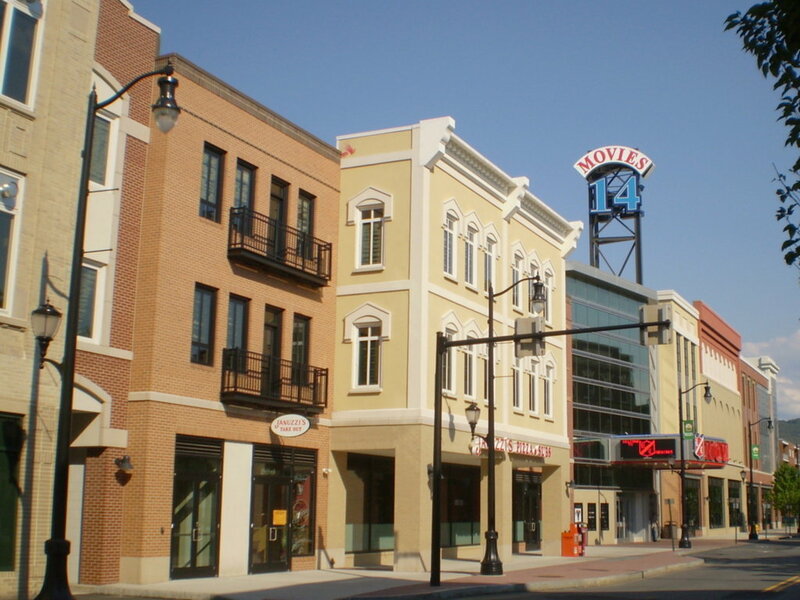 A short drive or walk downtown will take you to a hub of businesses and entertainment. Recently the R/C Theaters Wilkes-Barre 14 opened on North Hampton Street, along with renovation of the city blocks around it. The $31 million project welcomes over 10,000 visitors each week. Around the corner on Main Street nestled among other shops and stores is a new Barnes & Noble bookstore and cafe. Further along in the city square sits The F. M. Kirby Center for the Performing Arts, a majestic theater that hosts concerts, plays, and performances by the Northeastern Pennsylvania Philharmonic. 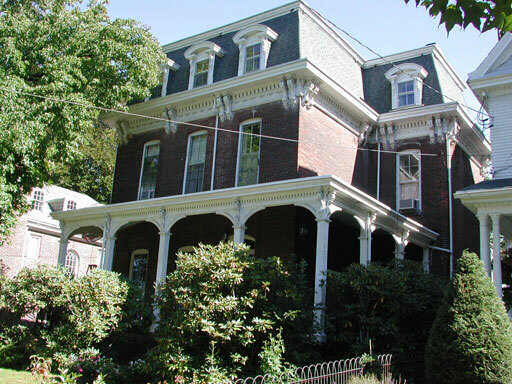 From your Wilkes-Barre apartment you can visit the lovely historic district of town, where the large houses and mansions of the past still stand beautifully renovated. This neighborhood is located near two great colleges, Wilkes University and King’s College. Many of these incredible homes are now used by the colleges or house business offices. Some remain residential homes or apartments. Victorian house in Wilkes-Barre, Pa. If art is your thing, you can venture out of your Wilkes-Barre apartment to visit the Wilkes Sordoni Art Gallery, part of the Wilkes University community. The gallery is open daily, regularly has new features, and is free to the public. If you have children, your Wilkes-Barre apartment may be close to one of the many nice schools in the area’s school district. Two of the three high schools in the district were listed on US News and World Reports Best High Schools list. Private schools and Catholic schools are nearby also. The city is nestled next to the Susquehanna River and on a day when you want to get out of your Wilkes-Barre apartment and exercise the River Common walking trail is just the ticket. This paved trail leads along the river’s banks, goes through parks and recreation areas, and is a fun and energetic time where you can walk, run, or bike and see the beauty of the valley. Within a fifteen to thirty minute drive you will find more shopping opportunities in Wilkes-Barre Township where the Wyoming Valley Mall and the Arena Hub shopping centers are located. The Mohegan Sun Arena, the areas largest in-door stadium, features the local Wilkes-Barre/Scranton Penguins hockey team games as well as world-wide concert tours and shows. The Mohegan Sun Casino is a short drive away for gambling and “night-out” fun from your Wilkes-Barre apartment. To help you find a Wilkes-Barre apartment or home for rent visit Apartmentstolike.com for listings and renters information. For landlords, we welcome your listings and offer free listings for your available rental. 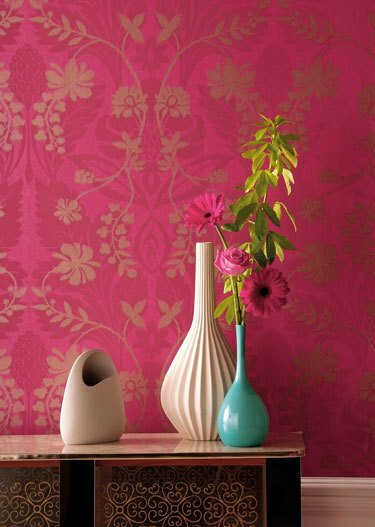 Pink wallpaper…with a blue touch, so simple, so lovely. 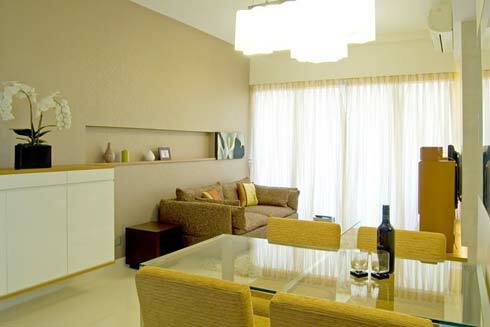 Visit Apartments i Like.com to list your available apartment for Free! As a Landlord, How do you advertise your rental? A newspaper ad? A sign in the available apartment’s front window? How responsive are people to your advertising endeavors? How much does it cost you? How many months do you go without income from your unoccupied space? Have you looked online and get discouraged or confused about how or where to list your rental? What if you could get a web-presence for you available rental that was easy to do and absolutely free? At Apartments To Like.com, a premier rental listing site, you as a landlord can find an incredible way to advertise to potential tenants your available rental space, whether it be an apartment or home. Apartments To Like was created and is managed by a highly experienced landlord who knows the needs of landlords (and renters as well) and has built this listing website to give rental property owners a way to present their available listings in the best possible light. The expertise presented in this listing site is above and beyond other similar listing sites. And the best part – You can list for FREE! No kidding! No strings! 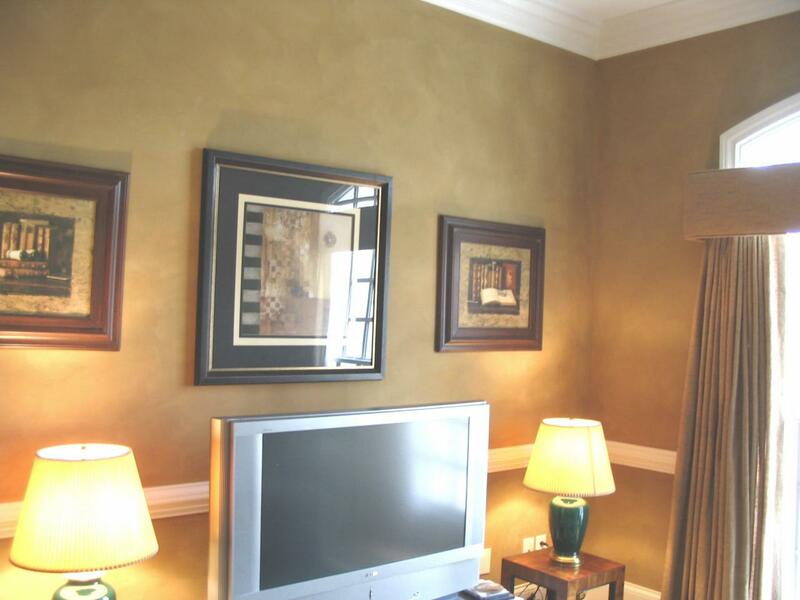 Apartments To Like.com offers a quality do-it-yourself page to display your rental. With a few easy clicks you can highlight all the amenities and features that your rental space offers, enticing a future tenant. Photos can be added to your page straight from you computer. (And if you’re not sure how to do this, a step by step guide is offered to show you how!). Your listing page will also include a slide show of the photos you upload and a location map for your rental address. One of the most outstanding and interesting features of Apartments To Like.com is the Renters Connect System. This system is easy to follow and will give your rental listing maximum exposure by connecting your online Apartments To Like page directly from your local newspaper advertising. This one unique step will bring your apartment’s full description, pictures, a location map, and even a slide show of your rental to a prospective tenant who finds your listing in the paper. They can view your listing online with all the available info, including your contact information where they can reach you with their interest. Your listing is very easy to set up and a breeze to manage any time, any day, 24/7! It takes about ten to fifteen minutes to set up. That’s it. You can update your listing page any time, and when your apartment or home is rented, you can maintain the listing in a non-active status for future use. If you ever have questions about how to do anything, the competent staff at Apartments To Like will be available to help you so that your listing will get the highest and best quality presentation. As a added benefit, the resident writer may feature you listing on the Apartments i Like blog page, Facebook and Twitter. Visit Apartments i Like.com to get started. It’s an easy and exciting way to bring your landlord career to its fullest potential. 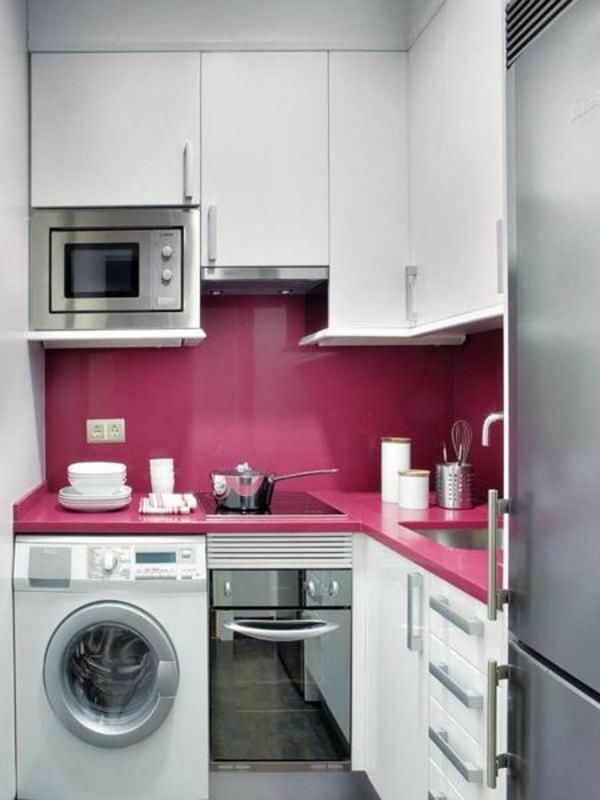 Who’s afraid of a little raspberry pink in their apartment? Okay, so maybe you answered “me!” but consider some of the subtle touches (yes, I said “subtle” even though it’s considered an outstanding color) that can be applied to your living space. Or just enjoy the idea of it…like I do. My house is totally ivory on white with shades of brown and chartreuse. 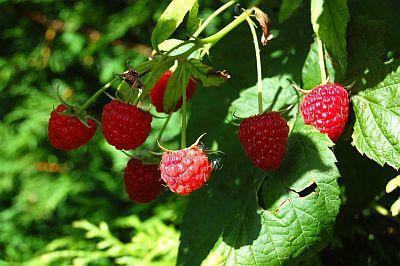 How I would love to create a new space with a touch of raspberry! 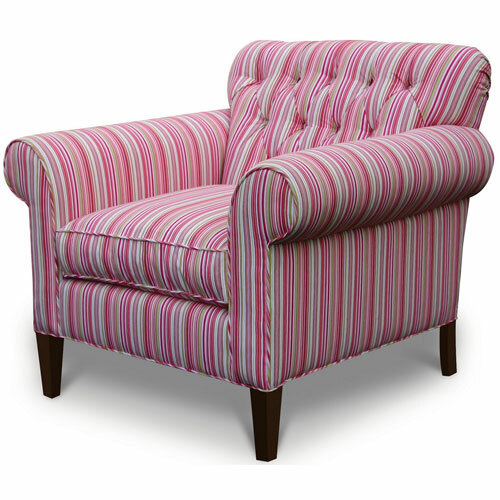 Love this raspberry velvet chair itself. The wall I could perhaps do without. Too Pepdol Bismal for me. Image via Decor Pad. 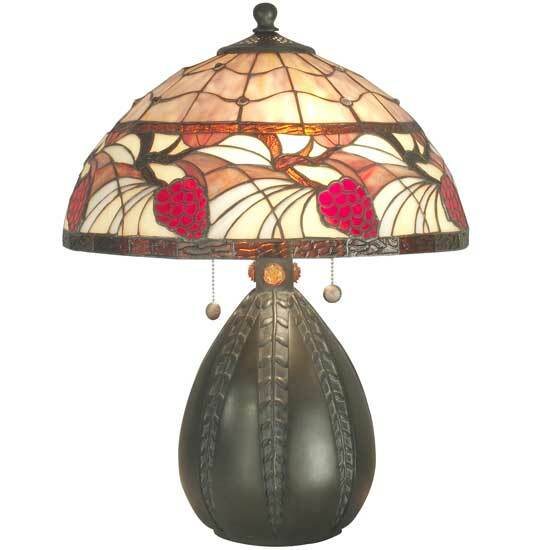 Raspberry Blast Tiffany Table lamp via Lamps on the Web. Add first three ingredients in a cocktail glass and stir. Top with bitter lemon. 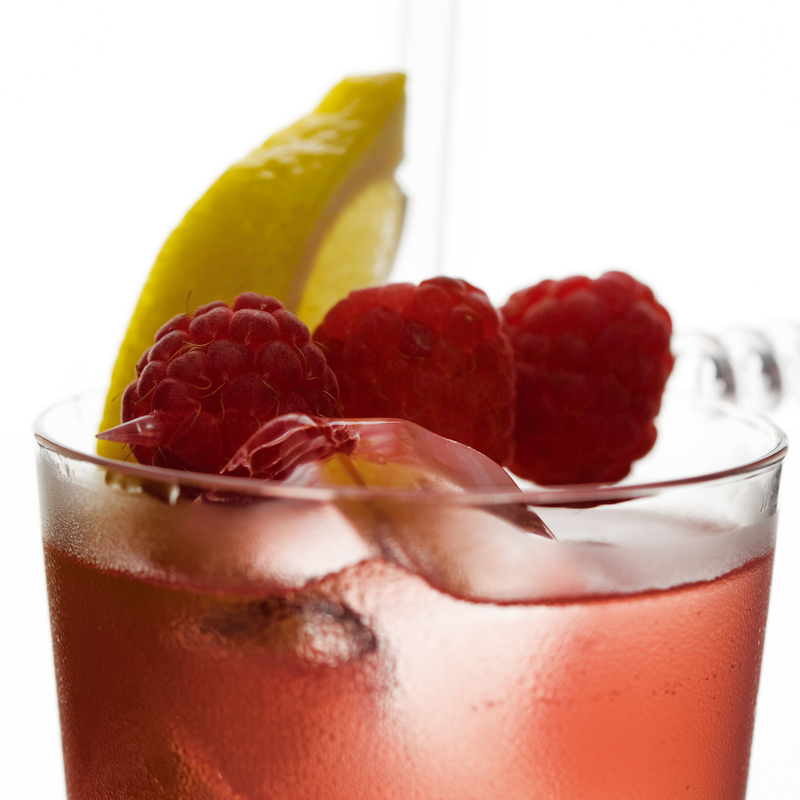 Garnish with a lemon wedge and fresh raspberries. Enjoy! Free advertising for rentals. Great Landlord Groups options! 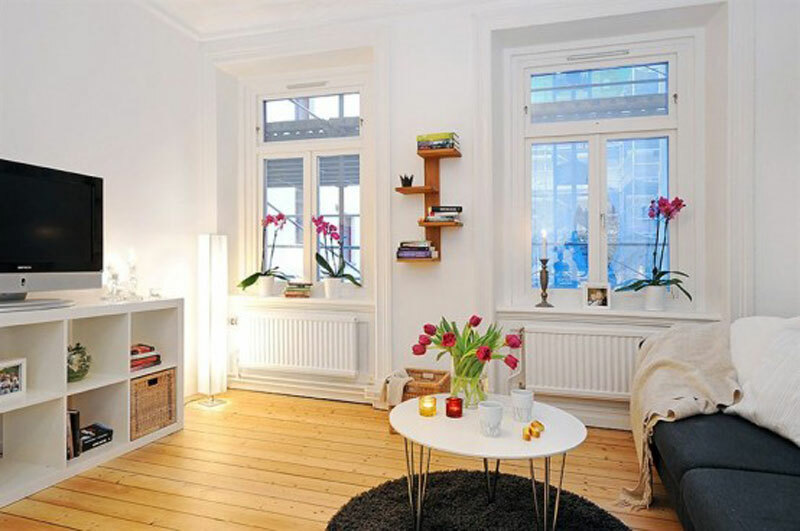 A small apartment need not lack sophistication and elegance. If you live alone in a tinier space making it warm and inviting for yourself is of great importance. The key is to keep a small space clutter free, which can be hard with little storage space, but if you can find a way it will be worth it. 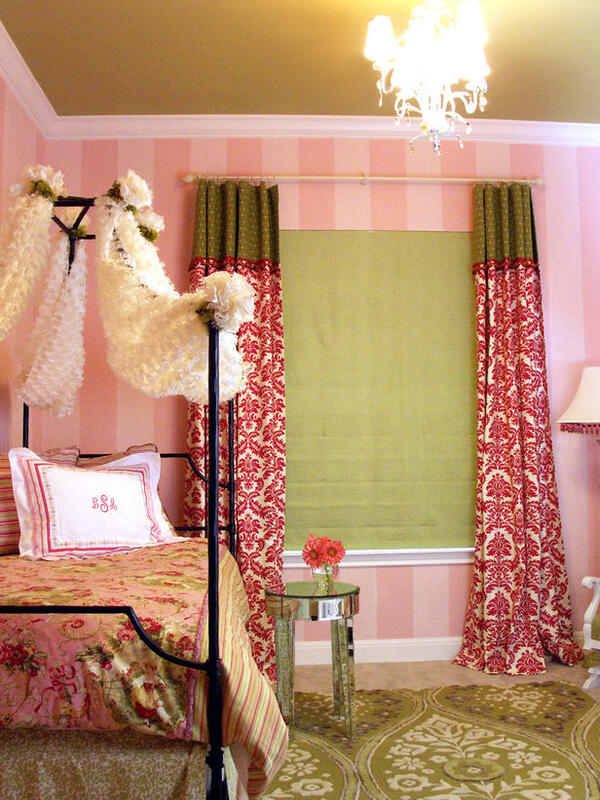 Stick to soft light color schemes to keep your small space fresh and bright. Here are a few more ideas to consider. Enjoy. 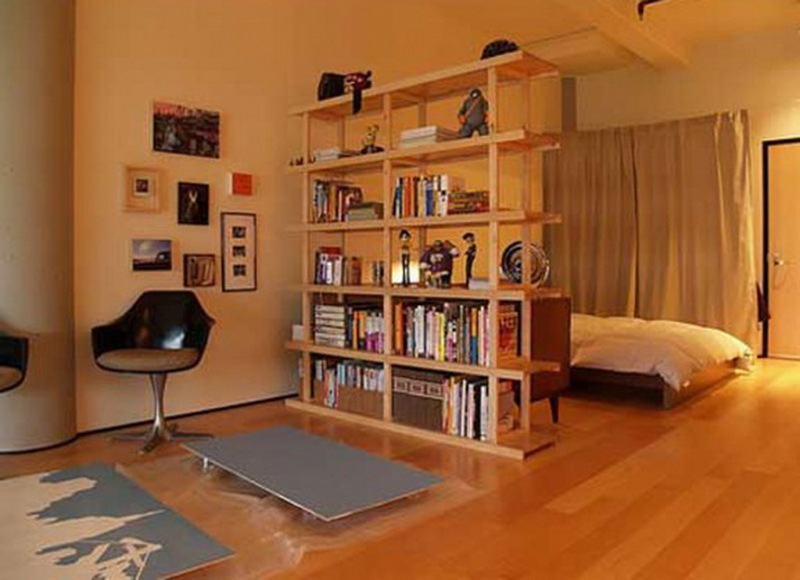 A small loft space can be divided easily by using storage as the “wall.” High free standing book shelves like these are ideal and placing a bedroom dresser next to it gives you the bedroom storage that you need for essentials. Love the clean, fresh feel this space brings. And everything is organized and accessible. A small kitchen doesn’t have to be a downer as you can see here. A back-splash of bright color bring it to life. 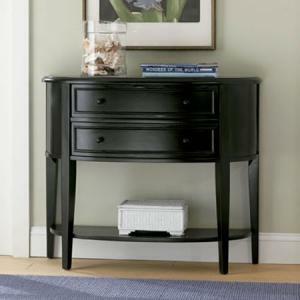 Again, keeping counter space neat and clutter-free sets off this small space. A white color scheme works great in a small space. 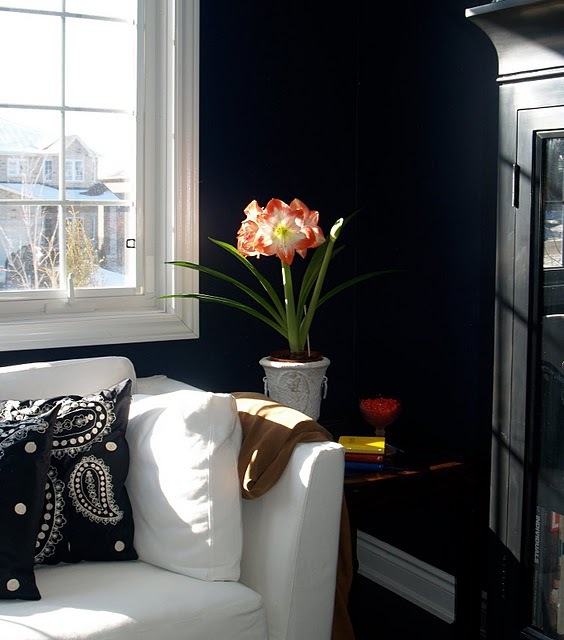 Contrast with dark furniture and a small carpet, and remember to add a splash of bright color somewhere, as we see here with the flower arrangements. I find small apartments cozy and fun. They are certainly not the place for over-stuffed furniture, as comfy as that might be. We experienced a problem not too long ago finding furniture for a small room like this one. 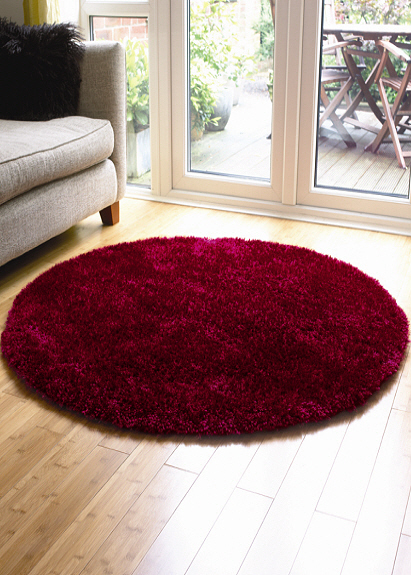 The living rooms tend to run big sized lately, so we settled on a similar look as this. It kept the room fresh and alive and easy to walk around in. Apartments i Like.com features Free advertising for landlords with available apartments. Give it a try. Twitter and Facebook exposure provided also. I love Ralph Lauren paint. It wears well and comes in so many colors and design options. 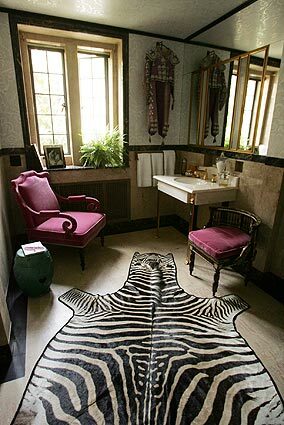 Love to Know Interior Design has this awesome article with helpful info and resources on how to use Ralph Lauren paints. 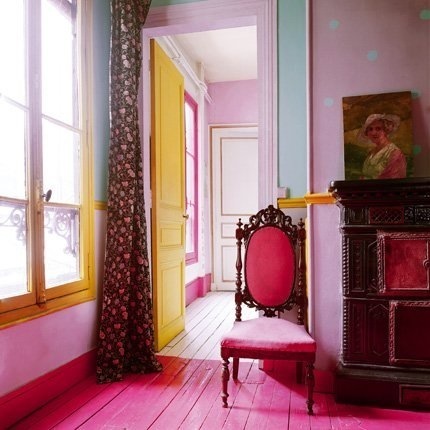 Meanwhile, here I’ve found some really creative decor pictures of Ralph Lauren paint in action.